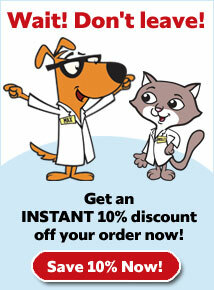 ProMotion for Medium and Large Dogs is a high quality nutraceutical that helps maintain healthy joints in dogs. It provides joints with the nutrients needed to remain healthy and is proven safe and effective. 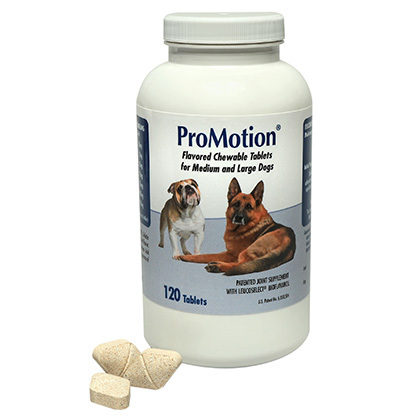 One of the active ingredients in ProMotion is glucosamine, which is a natural compound that is found in healthy cartilage in both humans and pets. It helps hydrate healthy joints by increasing the production of molecules that bind and hold water in the cartilage. 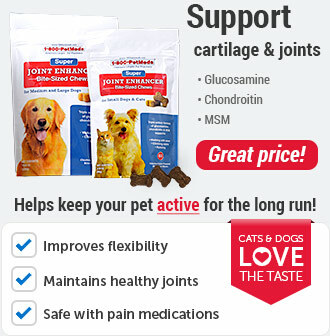 Healthy cartilage provides cushioning which helps protect a pets joints while exercising. Many believe that it provides clinical benefit in the synovial fluid by strengthening cartilage and aiding glycosaminoglycan synthesis. Further research on the effectiveness of glucosamine is still needed, but many of our customers find it to be very beneficial to their pets. ProMotion also contains manganese, which helps maintain adequate levels of nutrients required to build and repair connective tissue. Another ingredient, cysteine, helps the body detoxify and protects cells from free radical damage. This product is intended for intermittent or supplemental feeding only. Diabetic dogs should have their blood glucose monitored when taking glucosamine supplements. Manganese (10 mg), Zinc (2 mg), Ascorbic Acid (25 mg), Cysteine (25 mg), Bioflavonol (400 mg), Hydroloyzed Collagen (400 mg), Glucosamine (700 mg). ProMotion is a palatable nutrient and antioxidant supplement to help maintain healthy joints. 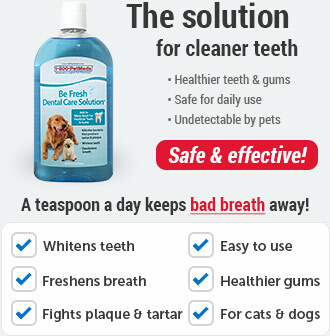 ProMotion Tablets is available as a chewable non-prescription (OTC) product. 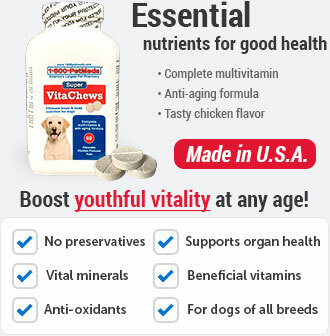 The usual dose for dogs 13 to 25 lbs is 1/2 tablet per day, for dogs 26 to 50 lbs give 1 tablet per day, for dogs 51 to 80 lbs give 2 tablets per day and for dogs over 80 lbs give 3 tablets per day. Double the maintenance usage for the first five days. The tablet may be crumbled and mixed with food to help with administration of the supplement. This product is intended for intermittent or supplemental feeding only. Significant response may not be noticeable for up to 3 or 4 weeks. Diabetic dogs should have their blood glucose monitored when taking glucosamine supplements. Response depends on each pet. 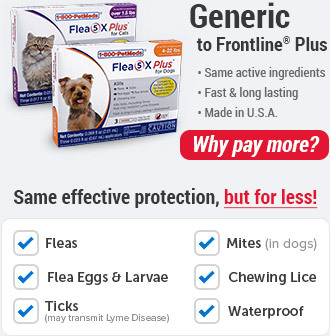 ProMotion for Medium and Large Dogs can be given with or without food. ProMotion for Medium and Large Dogs should not be given to cats. 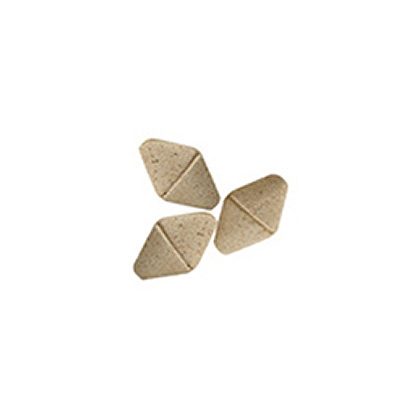 ProMotion for Medium and Large Dogs tablets can be crumbled and mixed with food. Double the maintenance dose as the initial dose for the first 5 days. Ingredients: Microcrystalline Cellulose, Glucosamine HCl, Gelatin By-products (source of Hydrolyzed Collagen), Vegetarian Beef Flavor, Pork Liver Meal, Vegetarian Bacon Flavor, Manganese Amino Acid Chelate, Dried Whey, Ascorbic Acid, Grape Seed Extract (source of Bioflavanol), Cysteine, Zinc Amino Acid Chelate. 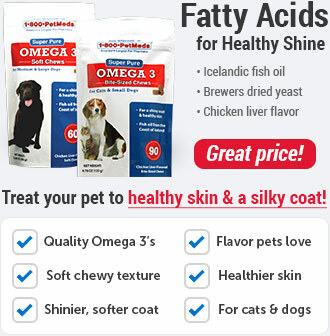 * Not recognized as an essential nutrient by the AAFCO Dog/Cat Food Nutrient Profiles.